Agar (or agar agar — why say it once when you can say it twice?) is a classic dessert/snack ingredient used throughout Southeast Asia. It’s not generally viewed as a vegan gelatin substitute as it often is in places where people aren’t familiar with it. Agar doesn’t behave exactly like gelatin, and I don’t think it appreciates being described as a gelatin substitute or, worse, a gelatin wannabe. Some similarities exist between agar and gelatin, but there are two main differences. One is the texture. Gelatin is jiggly; agar is harder and more brittle (it breaks into shards, if you can visualize this with me). The other is the way they’re activated. You can activate gelatin with hot water; with agar, you need to activate it in boiling liquid or it won’t set (if that happens, simply put the unset agar into a pot and boil it). Telephone brand is a reliable brand that is easiest to find. There are several types of agar desserts in the Thai repertoire. One is what’s featured here: coconut-pandan agar which is made of alternating layers of sweet and slightly salty coconut milk-based agar and pandan-infused agar. Another, which may seem like an odd combination of flavors but actually works very well, is coconut-coffee agar which is made the same way as the former except it pairs coconut with coffee instead of pandan. The recipes for both are only slightly different. I’ve written a recipe for the coconut-coffee agar (the variation which I like much better than this one, to be honest) on Serious Eats. My post there also has additional information and instructions on how to work with agar and how to alternate agar layers. 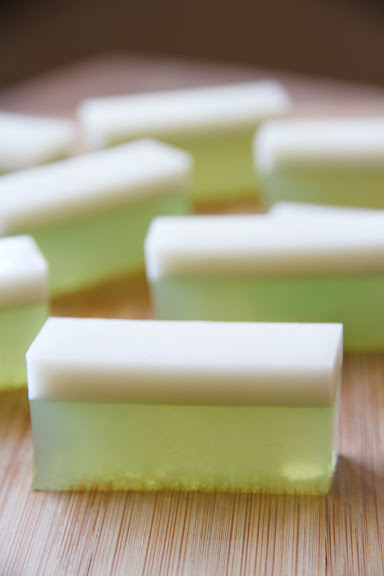 For those interested in the coconut-pandan agar, here’s a recipe for you. Note: You may wonder why milk is necessary, why not just use coconut milk. From my experience, whenever I use canned coconut milk, the finished coconut layer almost always separates into two visible sub-layers: one of coconut cream and one of coconut “whey.” It tastes fine, but is aesthetically challenged. If you don’t mind that, go for 1 1/2 cups of unsweetened canned coconut milk instead of 1 cup coconut milk and 1/2 cup whole milk. If you have access to freshly-squeezed coconut “head” (the first and most concentrated extraction), by all means, use that as it’s the best. Vegans, you can substitute whole milk with soy, almond, or drinking coconut milk. Cut the pandan leaves into 1-inch pieces and place them into a blender along with 3/4 cup water; blend until smooth. Strain the mixture through a fine-mesh strainer and measure out 1/2 cup of pandan juice; set aside. Put all of the coconut layer ingredients into a medium saucepan, whisk to blend, and bring the mixture to a hard boil over medium heat. Keep it boiling for 30-40 seconds being careful not to allow the liquid to boil over. Remove from heat and pour into a 8x8x3-inch pan (no need to grease the pan). While waiting for the coconut layer to set, make the agar layer. Add the prepared pandan juice along with the remaining ingredients for the pandan layer into another medium saucepan. Follow the same instructions for the coconut layer but do not pour the mixture into the pan yet. This is a tricky part. Check to see if the pandan layer has set. You don’t want it to set too hard as that prevents the two layers to stick together once both have set. You want the surface of the coconut layer to be barely taut and for the whole layer to jiggle when you shake the pan. When it reaches that stage (should take about 15 minutes), gently pour the pandan layer on top, holding the pot as close to the surface of the coconut layer as possibly so as not to bore a hole in the coconut layer with the stream of warm pandan agar mixture falling from a great height (I flunked physics, but this I know from experience). Let both layers set hard, about 30-45 minutes at room temperature. This is a dessert that I am in love with. I grew up eating this but unfortunately I rarely have it. Thank you! I cannot get Pandan leaves here. How much of the extract should I use instead? Inga – Assuming you’re using the kind of pandan extract that comes in a little glass jar as opposed to a can, 2 teaspoon would be enough. 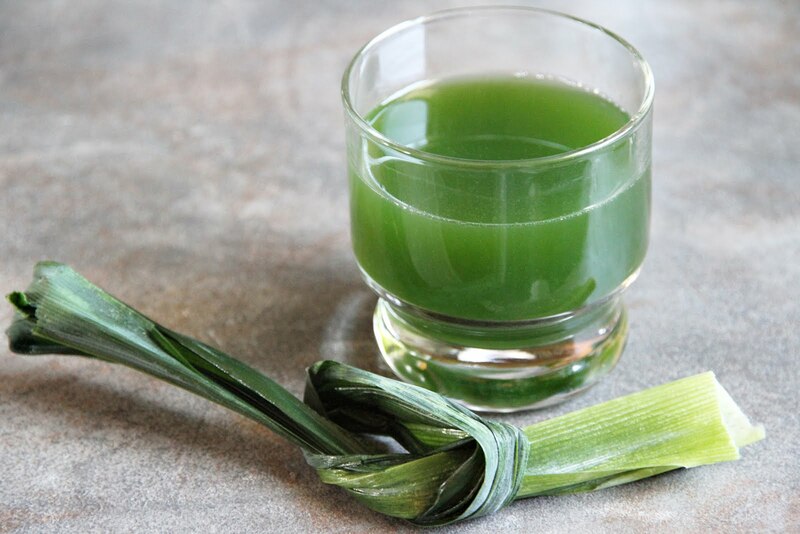 Be sure to make up for the loss of liquid in the recipe by replacing the pandan leaf juice with plain water. Impressive recipe! This desert is so much different from deserts in Brazil. 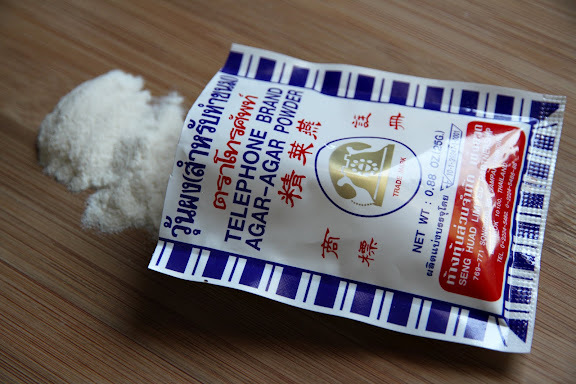 I would like to try this, but I’m not sure where get agar powder here :(. Maybe delivery? David, I live in Brazil too as well and I’m pretty sure you can find agar powder in the Mundo Verde chain of stores. David – If there’s a local source (even online) for specialty pastry items, you may find agar powder marketed as a vegan gelatin substitute. Otherwise, online Asian grocer? Good point! Thanks for advice. I assume it would be hard to get agar powder, but I will do my best! I have never had panda leaves but i know for a fact that I can’t get here where i live. I wondered, however, if I could use lemongrass as a substitute; it might pair well with the coconut. Any thoughts? Thanks for all the great recipes and info, I love this site. I have never tried it, but I have a feeling I would not enjoy that combination (which is not to say that it’s a bad idea). Floral scent tends to work better in this particular application than herbal. If you don’t have pandan leaves, use commercial pandan extract that comes in a small glass bottle. Or leave it out and use rose or jasmine extract. Thanks for the idea. I’ll try that instead. As well as the coconut/coffee combo in serious eats, which looks superb. My phone autocorrect turn pandan juice to panda juice all the time. No worries. Nice. Another cool use of agar is gel clarification. You can use it to make clear citrus juices without damaging their flavors. Found that trick at cookingissues.com. Hi, your agar looks so lovely!! Just to check how much sugar is needed for the coconut layer? Is it half or one cup? Oops. It’s 1/2 cup. Thanks for pointing that out, Nasha. I’ve already fixed it. I cannot wait to try this dessert.. Thank you! Many years ago I lived in California, where some Cambodian friends made this. Or I should say something very similar. The lower layer was a more gray color, and I was always under the impression that it was also coconut rather than pandan or coffee. I’ve wanted to recreate it, just for old times sake. This may be as close as I get.